We were big fans here at Broken Frontier of Mike Mignola and Warwick Johnson-Cadwell’s graphic novella Mr. Higgins Comes Home back in 2017. Both a loving tribute and pastiche of the Hammer horror films we described it as “a boisterous romp of a read, delivered at a breakneck speed that will have you eagerly turning the pages as it sweeps you along in its manic, macabre madness” when we reviewed it here at BF. So we’re delighted to hear a sequel is in the works, fittingly for this Halloween. You can read the full Dark Horse Comics press release below. MILWAUKIE, Ore. (March 19, 2019)—This fall, Dark Horse Comics will publish the original graphic novel OUR ENCOUNTERS WITH EVIL: ADVENTURES OF PROFESSOR J.T. MEINHARDT AND HIS ASSISTANT MR. KNOX, the sequel to the acclaimed graphic novel MR. HIGGINS COMES HOME created by legendary Hellboy creator Mike Mignola and Warwick Johnson-Cadwell. In this installment, Professor J.T. Meinhardt and Mr. Knox continue their pursuit of ne’er-do-well creatures of the night. Now, backed by the dauntless vampire hunter Ms. Mary Van Sloan, the heroes pursue vampires, werewolves, and other horrors that even they are hard-put to name or explain. The only thing that’s for certain? The strange truths these adventurers uncover are seldom what they seem. 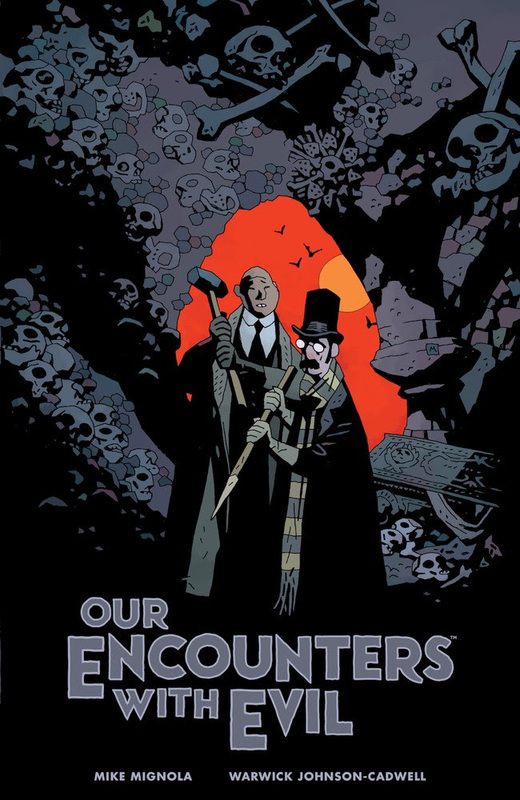 Dark Horse will publish the hardcover graphic novel―created by Mike Mignola and Warwick Johnson-Cadwell, with story and art by Warwick Johnson-Cadwell, lettering by Clem Robins and a cover by Mike Mignola with Eisner Award-winning colorist Dave Stewart―in comic shops and bookstores in October, ahead of Halloween.